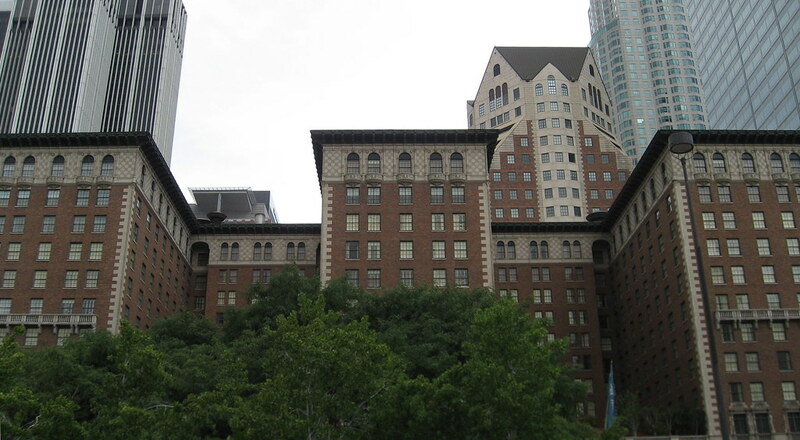 When the eleven-story Biltmore Hotel opened on October 2, 1923, it was the largest hotel west of the Mississippi. 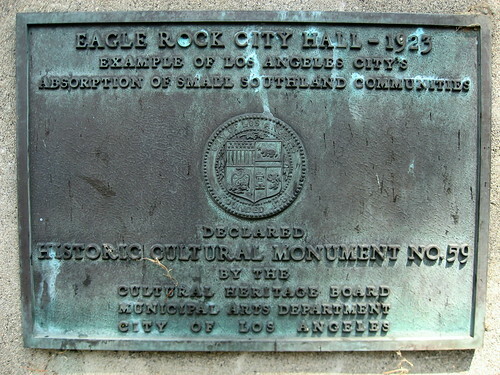 Do not underestimate what a huge deal this was to the city of Los Angeles. 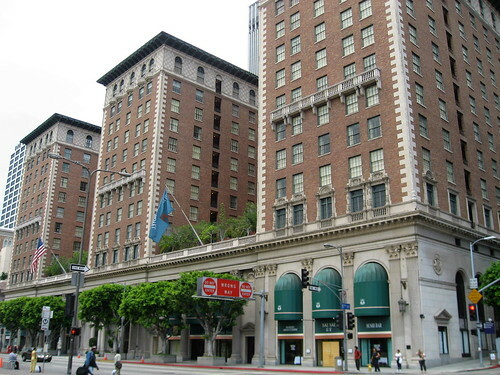 The construction, opening, and early operation of the hotel held the attention of Angelinos for years. 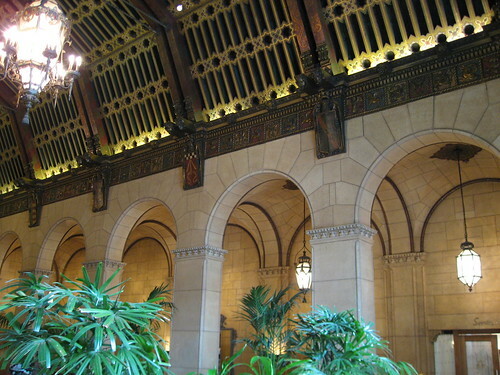 The Biltmore was a major factor in elevating the status of Los Angeles in the eyes of the rest of the country. Much of the following information and all of the color photos were gotten during a Los Angeles Conservancy tour (for members, $5 - cheap!). 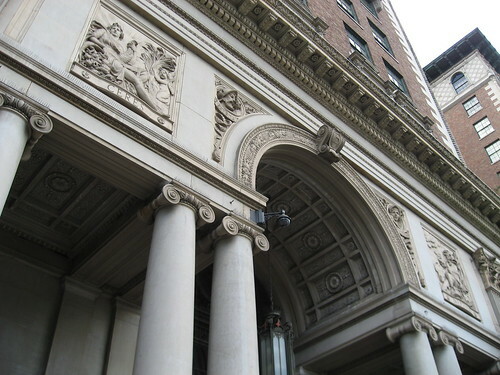 The man hired by the Central Investment Corporation to run the hotel was Manhattan’s John McEntee Bowman. He had lots of conditions to coming on board, including choosing the architects. 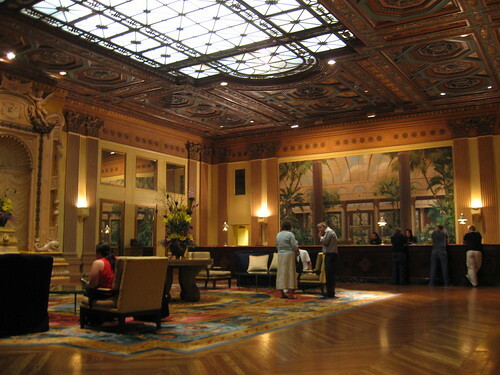 He chose fellow New Yorkers Leonard Schultze and S. Fullerton Weaver, standing today as perhaps the most successful hotel architects ever (the Waldorf-Astoria, the Sherry-Netherland, the Breakers). 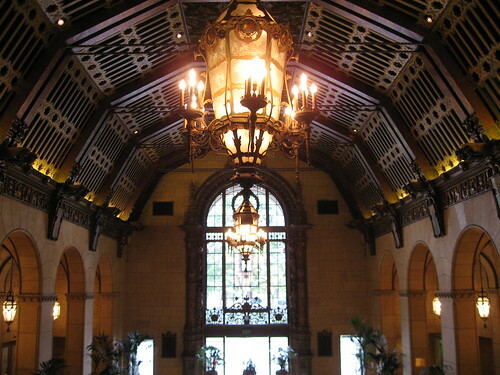 The men designed the Biltmore in the Beaux Arts style with some Italian and Spanish Renaissance thrown in. 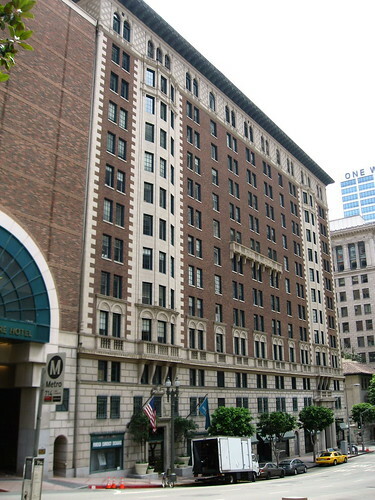 The hotel was constructed on three plots of land, including the sites of the Young Women's Boarding Home, at 514 South Grand Avenue (once owned by the Salvation Army) and St Paul’s Pro-Cathedral. 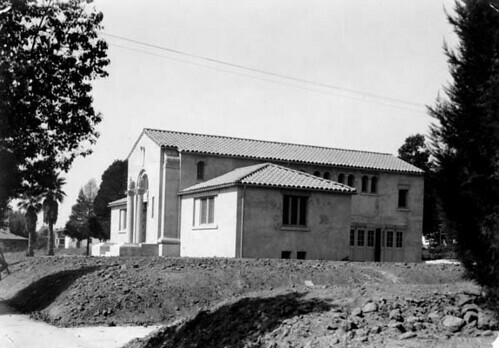 St Paul’s held its last services on February 12, 1922. 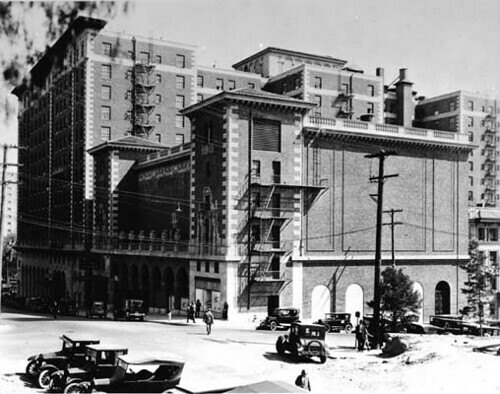 As the Biltmore was being constructed, plans were hatched to begin work on the Biltmore Theatre. 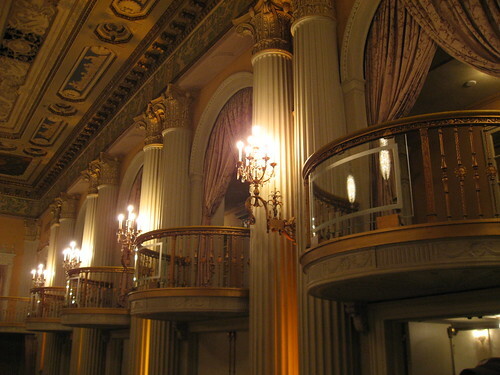 The playhouse, seating 1,700, was constructed adjacent to the hotel (they were connected by an arcade). Opening night tickets were printed on brass. It shut down in 1964. That's it, above. In the two shots below you can see the way it looks today. 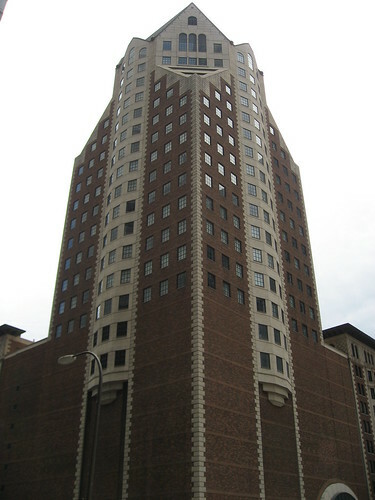 A Biltmore-esque office tower, the Biltmore Tower, now occupies the site. 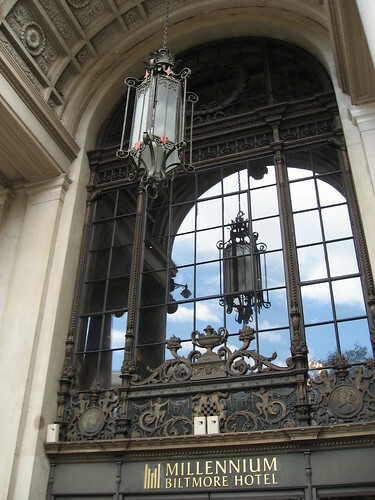 "Half a dozen orchestras furnished music, the Art Hickman organization, which is the regular Biltmore orchestra, being assisted by musicians from the Palais Royal. 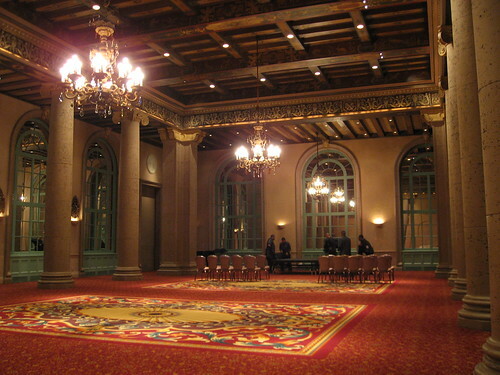 The Herman Heller Orchestra of fifty pieces from Grauman’s Theatre was stationed in the main lobby, where it rendered concert selections during the progress of the dinner." I'm too lazy to find out with exactly how many rooms the Biltmore opened. 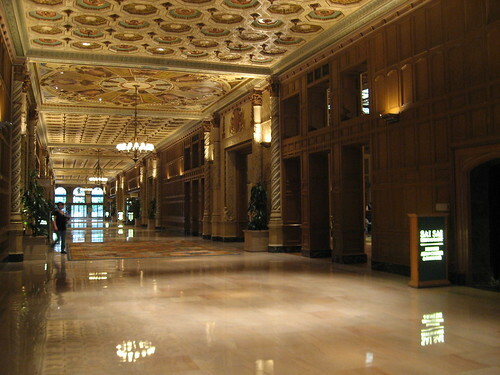 I've found no two matching numbers - anything from 916 to 1112 rooms were available. 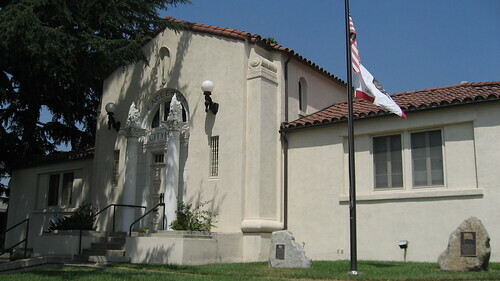 Below you can see, in four reliefs, Ceres and Neptune on the outside Balboa and Columbus on the inside. 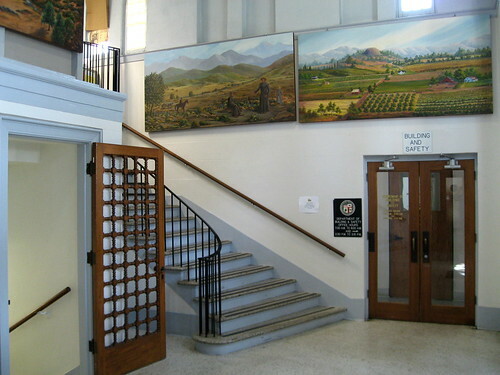 This is the original lobby off Olive with its travertine walls and wrought-iron stairway (a replica of one in Spain’s Burgos Cathedral). The space is now the Rendezvous Court. You can get dinner here, but it’s main function these days is as a tea room. 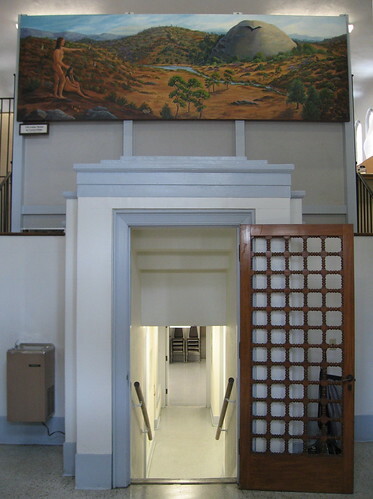 When you go those stairs and past a bank of elevators, you enter the center of the 300-feet long gallery, originally known as the Galleria Real. Here the work of Giovanni Smeraldi really stands out. 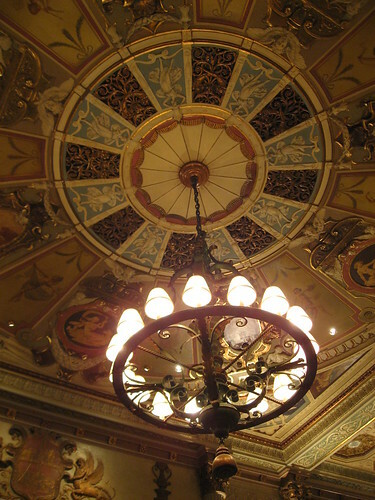 The Italian muralist is responsible for much of the plasterwork, sculptures, and artwork found in the hotel. Looking at the ceiling of the Galleria, it makes sense Smeraldi’s work can also be found in the Vatican. Today, a hotel restaurant bears his name. I should also mention Smeraldi’s apprentice, Anthony B. Heinsbergen, who also put in his fair share of work into the hotel. 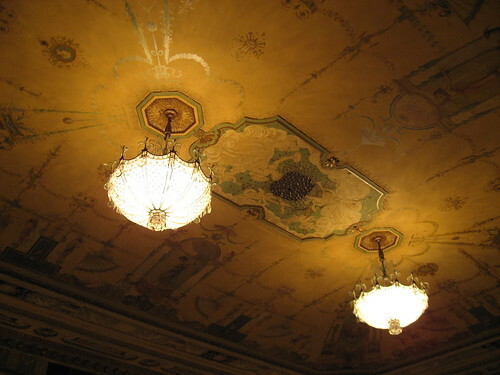 The ceiling art in the Rendezvous Room is attributed to Heinsbergen. 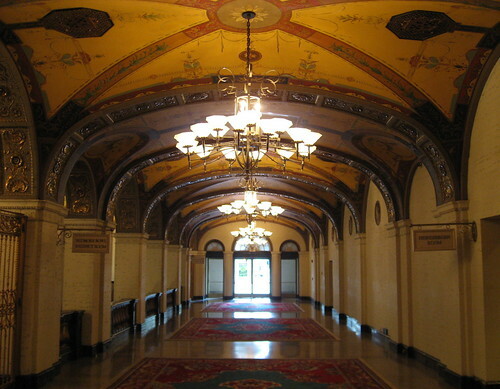 Above and below are pictures of the same room - then the Music Room, now, since the mid-1980s, the hotel lobby. 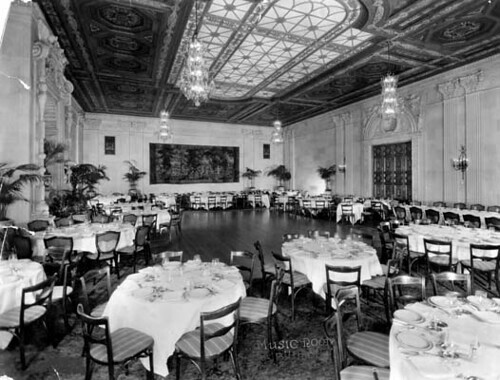 In the picture below, the lower part was originally the palm room, the upper the supper club. 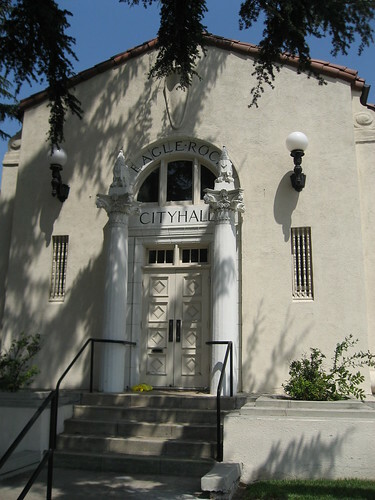 Both now are known collectively as the Gold Room. 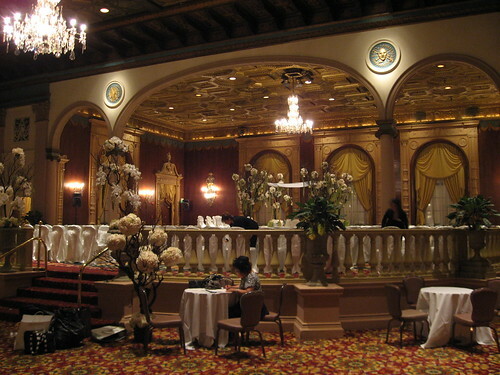 Here's the Crystal Ballroom, formerly known as the Crystal Ballroom. 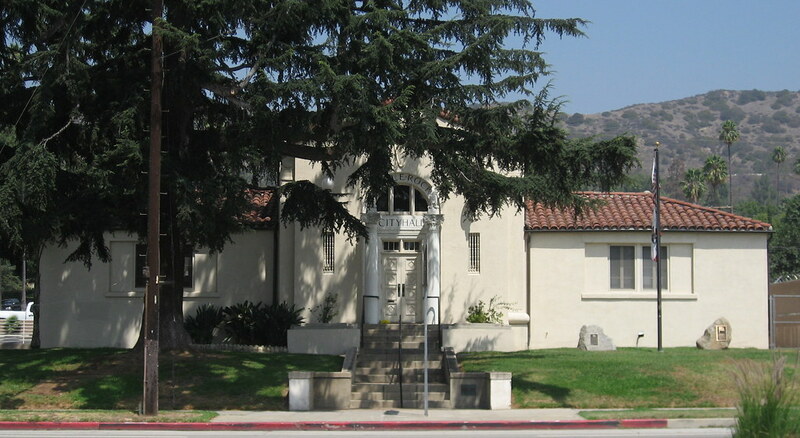 Legend has it the Academy of Motion Picture Arts and Sciences was founded in this room in 1927, and that it’s where Cedric Gibbons first sketched out on a cocktail napkin what would become the Oscar trophy. 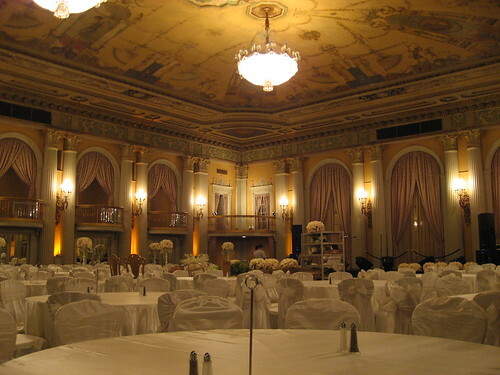 The Biltmore hosted the Academy Awards on and off from 1931 through 1942 for a total of thirteen times. 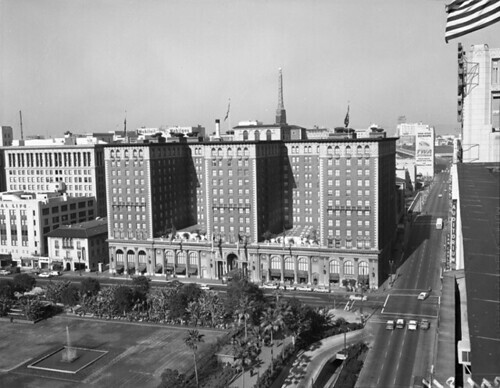 John F. Kennedy was nominated for president at the Biltmore when the hotel hosted the 1960 Democratic National Convention. 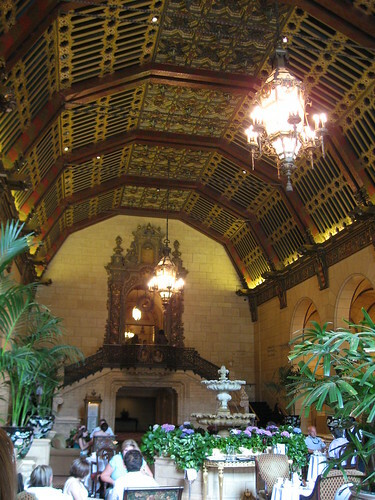 In the mid-1970s, architects Gene Summers and Phyllis Lambert bought the Biltmore and gave it its first major restoration. Below is a corridor stretching back to Grand Avenue. 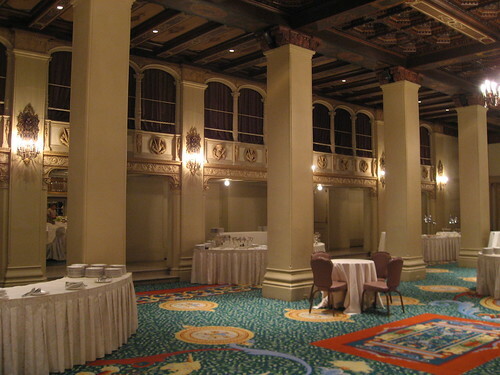 Towards your left are stairs leading down to the Biltmore Bowl and Regency Room. The rooms weren’t part of the Conservancy tour. 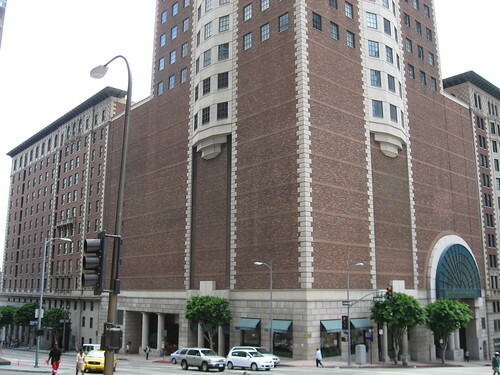 In 1984, new owners undertook an additional renovation and added the office tower to the site. Just after this, another remodeling occurred, this time by Barnett and Schorr and to the tune of $40,000,000. 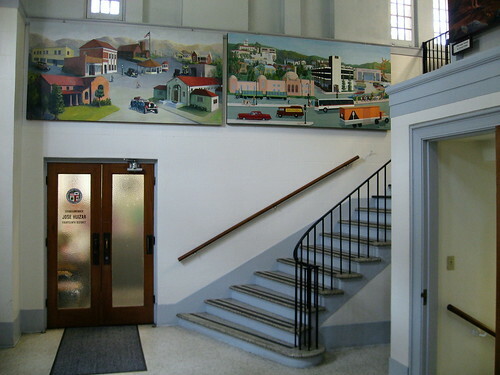 This is when the reception area was moved to the Grand Avenue side of the building. 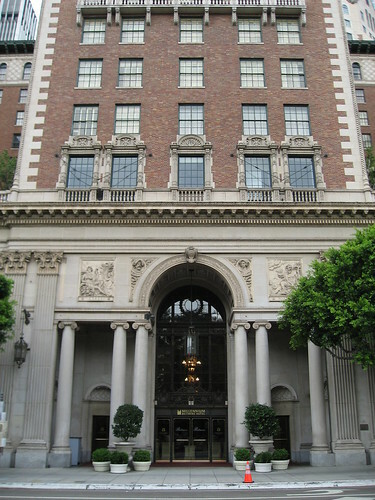 Much of the art restoration was performed by Heinsbergen’s son, Anthony T.
Upon purchase by Millenium Hotels and Resorts in 2000, the L.A. landmark became the Millenium Biltmore Hotel. 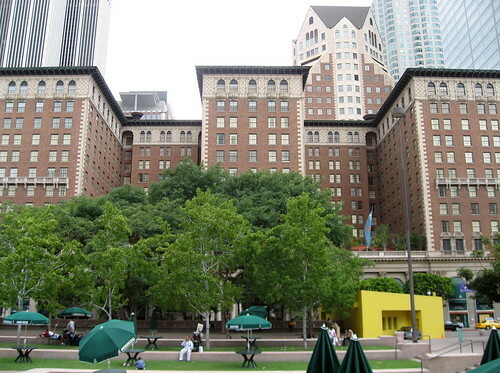 Tons of movies were, in part, shot here, including Vertigo (no! 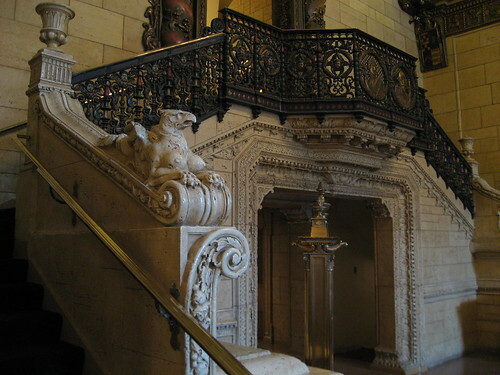 we didn't see the staircase! 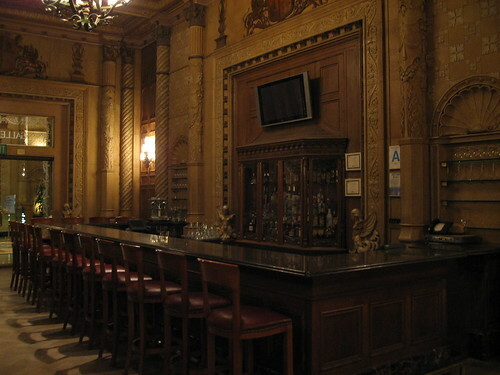 - note to Conservancy), The Sting, The Poseidon Adventure (1972), Chinatown, A Star Is Born (1976), The Fabulous Baker Boys, Ghostbusters, Bugsy, Beverly Hills Cop, and The Wedding Crashers. I’d bet if you ask aficionados of silent comedies who their favorite comedian is, most would say Keaton, Lloyd, or Stan and Ollie. For some reason, Charlie Chaplin hasn’t held up as well. However, back in the day, Charlie was the real superstar. In fact, quite possibly, Charlie Chaplin was the most popular celebrity. Ever. 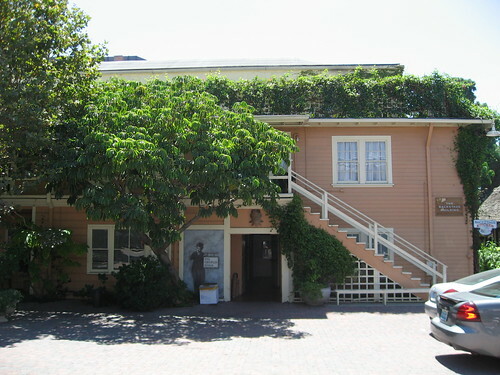 When Chaplin struck out on his own as an independent producer in 1917, leaving Mutual for First National, he built his very own studio, one of the earliest in Hollywood. 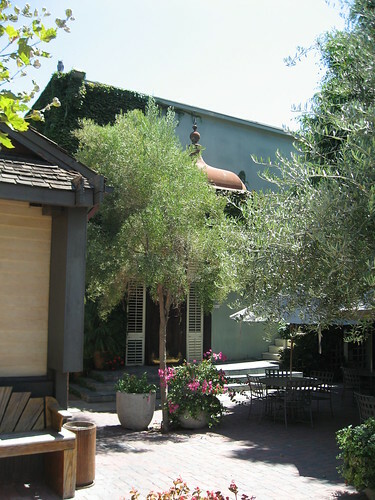 Now, there are a lot of discrepancies out there regarding the Chaplin Studio. The first revolves around the adjacent property to the north. 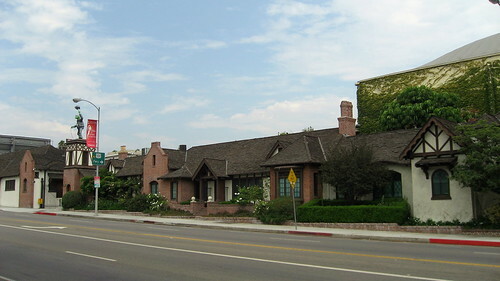 Some reference material say Charlie built the studio behind his home at the corner of Sunset and La Brea, other sources say the home was owned by his brother/business partner, Sydney. It could also be that C.C. 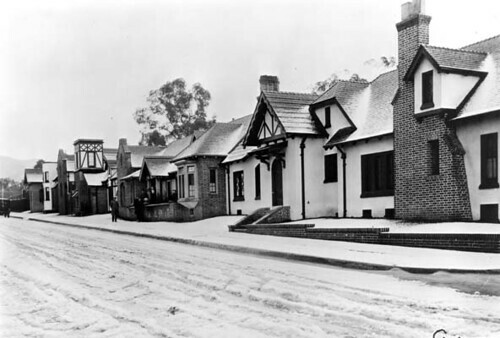 first bought the land which included the home, into which he or Sydney moved afterwards. If you know, let me know. In any event, on the homestead site today is a store selling DVDs – cheap! 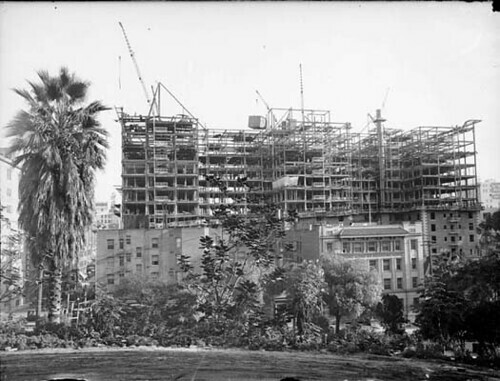 As far as the studio’s opening is concerned, the year 1919 is cited by many sources (including the Cultural Heritage Commission), but it’s fairly established that construction commenced in 1917, with the official opening happening on January 21, 1918. This site, part of TheLittleFellow.org, goes on to quote a Daily Mirror article from December 15, 1917, saying “The final lap of construction of the Charlie Chaplin motion picture plant, in Hollywood, Cal., was reached this week, when foundations on the last group of buildings were laid.” It went on to say the entire plant would be completed within three weeks. 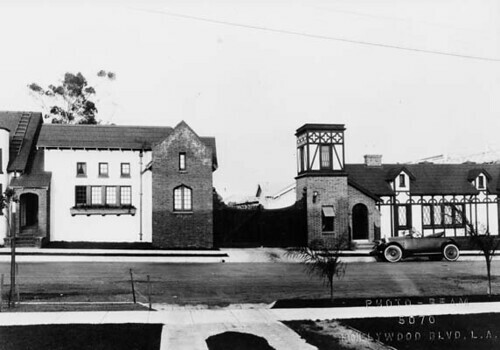 To boot, a Los Angeles Times article reports on D.W. Griffith’s plans to build a new studio in Hollywood “… located near that of Charlie Chaplin, at La Brea and De Longpre avenues”. That was on November 9, 1917. 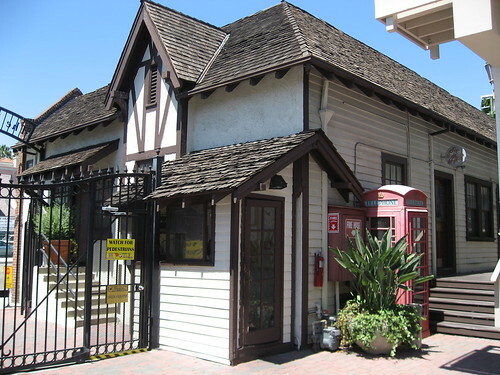 The buildings – at least the ones fronting La Brea Boulevard – are mainly in the Tudor style, and they resemble a little stretch of English village, partly. More or less. Chaplin’s greatest work was produced on the lot, including The Gold Rush, The Circus, City Lights, Modern Times, and The Great Dictator. 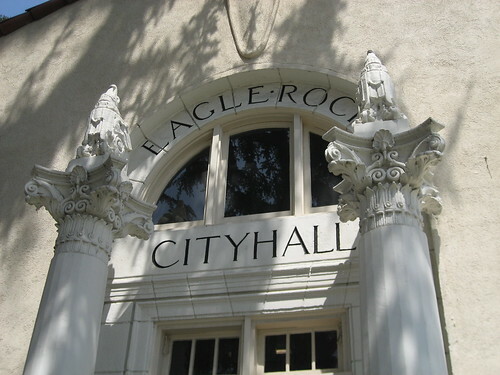 The first film shot here was the three-reeler “A Dog’s Life”, the last was Limelight in 1952, when Charlie split the U.S.A. for (almost) good. 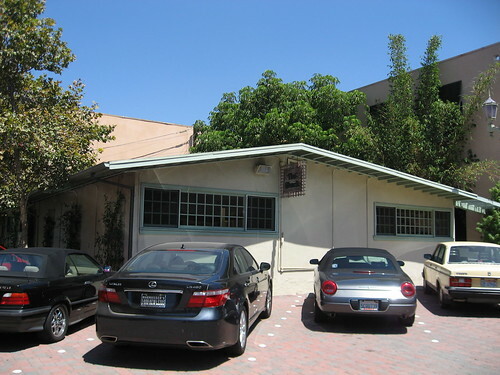 The studio was owned by Skelton himself from 1958 to 1962, and by CBS for a few years after that. I'm certain this building (above and below) is the current home of Henson's Creature Shop, where muppets are made. 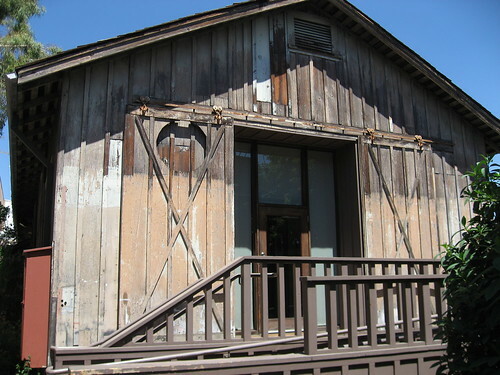 I'm fairly certain that, back in the day, it served as the carpenters' shop. There's a vintage studio map over at the L.A. Public Library photo database, but I'll be damned if I can make out what it says. 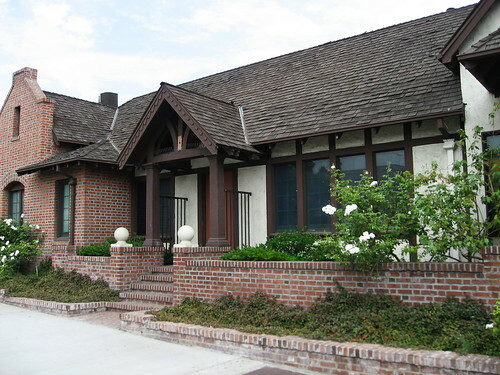 In 1966, Herb Alpert and Jerry Moss bought the studio to house their A&M Record Company and Tijuana Brass Enterprises, Inc. 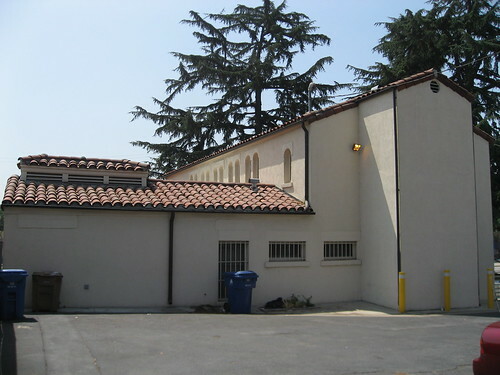 Tons of albums were recorded here, but the first thing usually mentioned is it was where the “We are the World” line-up, including Ray Charles, Bob Dylan, and Kim Carnes, recorded the song and shot the video. 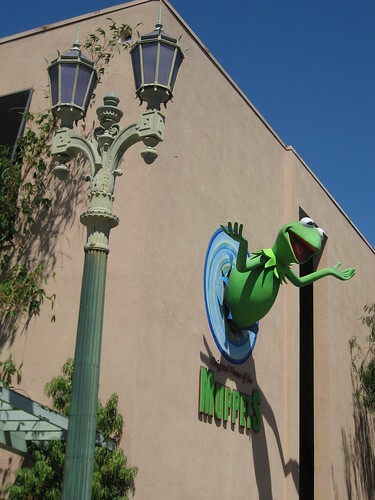 The studio changed hands yet again in early 2000, this time to the Jim Henson Company, which owns the site to today. Another discrepancy: while some report the original five-acre site has dwindled down to less than half that size, a February 12, 2000, Yahoo.com article reporting the Henson sale puts the land back at five acres with an 80,000 square-foot facility. 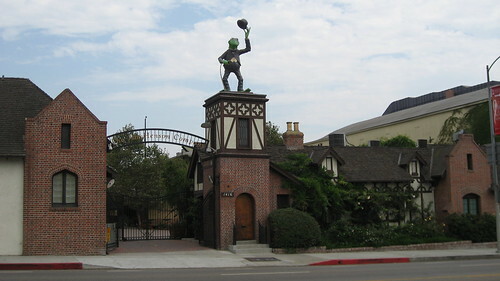 Brian Henson today occupies the office originally used by Charlie Chaplin. How cool is that? 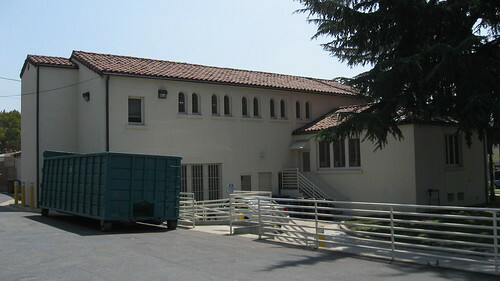 The building below is the old A & M recording studio. I think. If the chronology above is correct, the official Henson site is woefully incorrect. 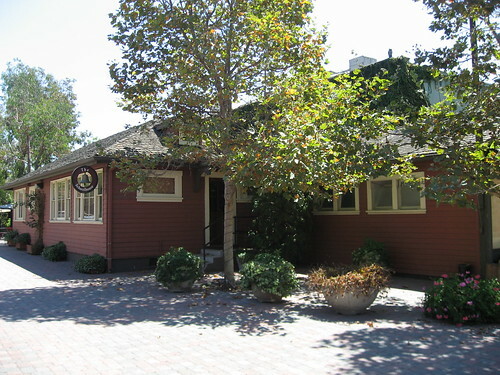 It maintains Charlie sold the studio in 1957, not 1953, with Red buying the studio in 1959. 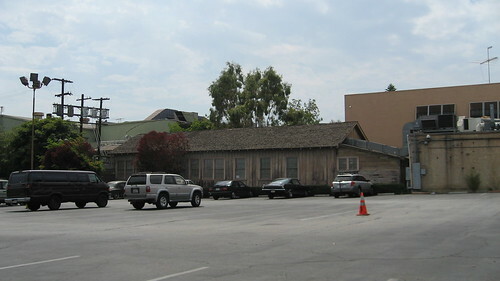 It also reports CBS purchased the lot in 1961. 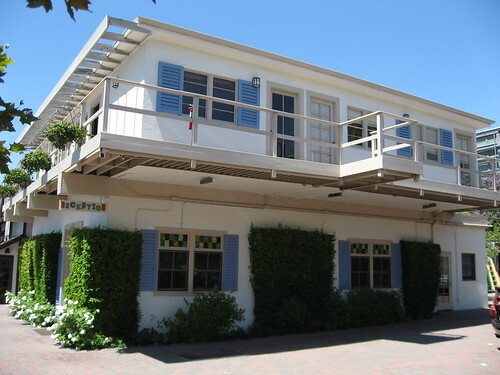 Finally, the Company says it bought the studio in 1999, moving in on May Day, 2000. 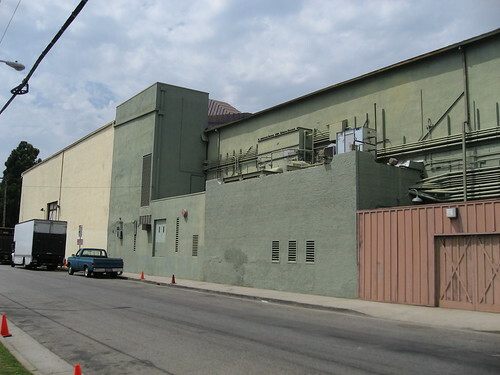 Well, I do know the building here leads into the larger Henson Soundstage, formerly the Chaplin Stage. While I did get the opportunity to prowl around a little, I really had little idea what I was looking at specifically. In the one case where I did know what I was looking for, I was duped. 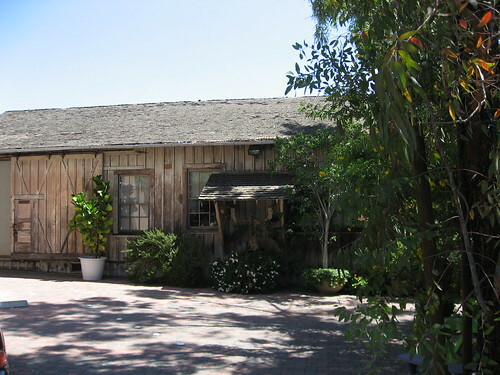 A few sites claim Chaplin’s footprints can still be seen in concrete outside Soundstage #3, but the Henson Company site, which I read only after visiting the studio, reports those footprints are now at Red Skelton’s old Palm Springs home. 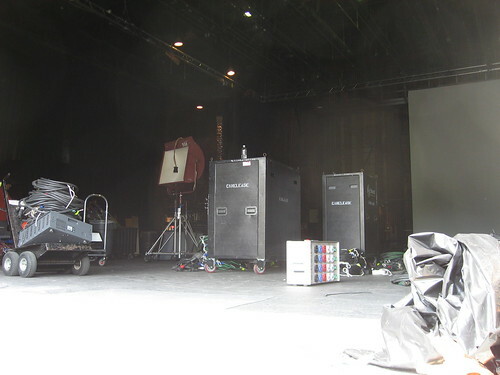 Swinging around to the De Longpre side, the rear of the soundstage was open with something going on inside. The shot above's the inside, the shot below is the De Longpre stretch. 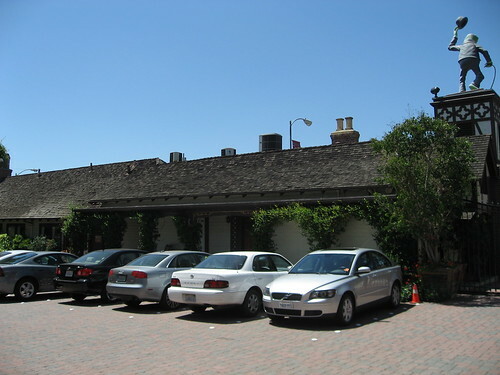 If you go back on North Sycamore, you get a view of not only the back of the Creature Shop, but also the parking area which once made up a big part of the Chaplin Studio backlot. If you see the DVD The Chaplin Revue, one of the volumes in The Chaplin Collection, you can watch “How to Make Movies” from 1918 which includes a time-lapse construction of the studio.